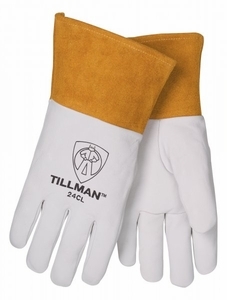 Tillman's kidskin TIG welding gloves have set the industry standard for over 30 years. Special tannage provides the best overall combination of strength and softness. 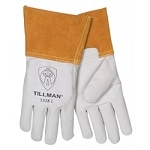 Premium Top grain pearl Kidskin leather enhances feel and durability. Unlined to maximize feel and dexterity. 4ö cuff for added protection. Straight thumb for best gun grip. Lock stitched with Kevlar® thread for added strength.